TheBlueGuerilla: Tory Slams Vernon Jackson For 'Choosing Rosyth Over Portsmouth'. Tory Slams Vernon Jackson For 'Choosing Rosyth Over Portsmouth'. 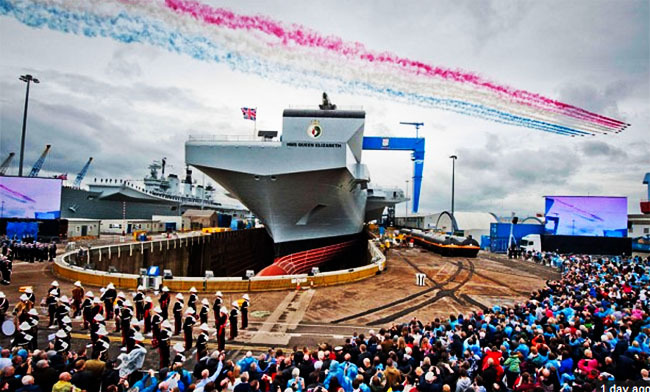 AS IF the bullying cover-up row wasn't enough Gerald Vernon Jackson has caused even more uproar in Portsmouth in the last few days this time by choosing to travel to the Rosyth Naval Base in Scotland for the naming of HMS Queen Elizabeth rather than stay to watch it at an event in his own city. Tory Councillor Robert New thinks Gerald needs to clearly examine his conscience. Robert told TBG - "It's very disappointing that Gerald Vernon Jackson chose to go to Rosyth over Portsmouth. "It just shows how he is only in it for his status especially given the low morale of dockyard workers getting little recognition for their part in building HMS Queen Elizabeth. "Gerald Vernon Jackson is a glory hunter who likes the pomp and ceremony with parliamentary ambitions over the people he's supposed to represent." It's also emerged that Portsmouth had representation in Rosyth from local MP's Phil Hammond and Penny Mordaunt. I'm a Conservative council candidate, but isn't this a little desperate?